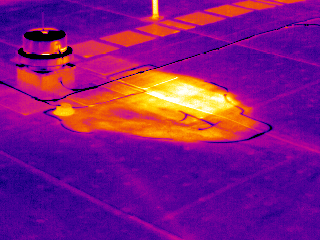 Thermal imaging is a proven technology for finding moisture problems that seem to infiltrate flat roofing systems. 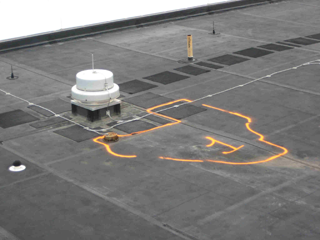 Given the extremely high cost of replacing your roof system, an infrared survey can be a valuable tool for finding the areas of your roof that are damaged and in need of repair. In a flat roof system, during a sunny day the roof will heat up at a fairly uniform temperature. At night, the areas of the roof that have moisture trapped beneath will retain their heat for a longer period of time. The longer that problems are permitted to prosiest, the more costly the repairs and the greater the liability. An experienced Thermographer can find, analyze and mark of areas that need repair. Timely repair of these areas can save your roof from any further damage. Annual and semi-annual (depending on climate) roof inspections are key to preventing water infiltration, mold, rust, structural damage, and building failure. A study by the Army Corps of Engineer states that moister can stay trapped in the roofs insulation for no less than 10 year and up to 100 years or longer. Thermal Techniques specializes in and only works with infrared. They have 3 full time Certified Thermographers & 6 state-of- the-art infrared cameras with a variety of lenses because no single camera or lens is optimum for every situation. Our Thermographer looks to help you reduces energy cost, verifies integrity of structure, prevent electrical fires, reduces insurance cost, and increases safety. The photo on the left shows a roof as one would see it. The image on the right is how we see it after a hot day. In the upper left corner you can see a large wet spot.